At the beginning of this year, I made it my mission to spend focused, quality time with my children. I want them to know that they are important and that I enjoy doing things with them. Rather than make a strict schedule of activities, I jotted out a list of possibilities and made it a goal that I would do something from the list every single day. It’s not a “bucket-list” per se but rather a one stop place for inspiration. Today I thought I would share that list with you. I haven’t done everything on this list (nor do I think I’ll do everything) but it’s a starting point. I plan on extending this list as I think of more ideas. 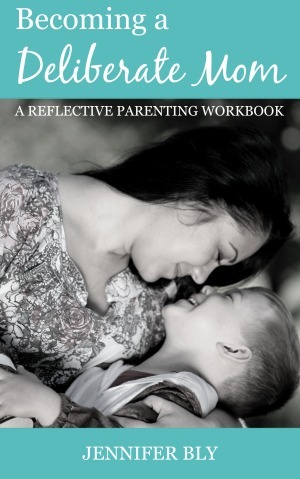 Do you find that sometimes you do more things for your children than with your children? 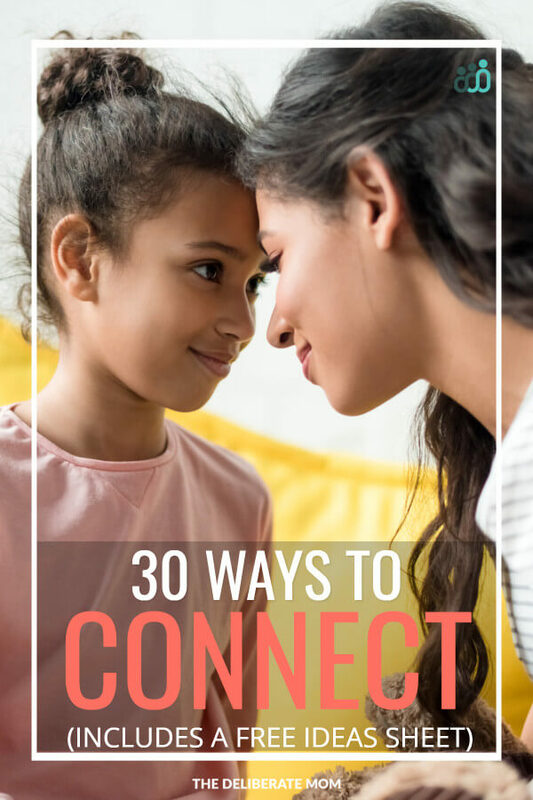 Do you wish you could find more ways to connect with your child? 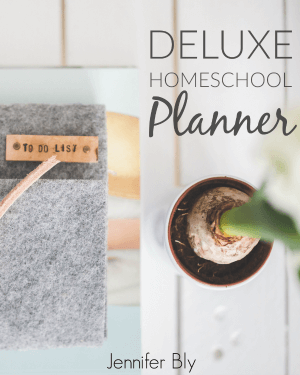 Psst – All of these ideas can be found on this handy download (plus there are 6 additional fun ideas)! I love this Jen as some days I truly feel like I haven’t done half of what I could do, but then I do lack ideas sometimes, as well. So this truly is a huge help and am going to definitely going to try a few of your ideas now with the girls!! :) xoxo!! I’m so glad you enjoyed this Janine and I’m delighted that some of these ideas excited you! That statement got me. I spend SO much time doing things FOR my kids, I don’t take enough time to do things WITH my kids! Thanks Chris… I’m enjoying doing more things with my children. I love all of these! A lot of them we already do, but there are some in here that I WANT to do! Thanks Jennifer! You’re so very welcome Echo! I would love to hear what activities you do try out. I’m so glad you enjoyed this list and I love that you were already working on your own! Awesome! I took some time off but I’m back (though not quite). I am loving these ideas of yours. I do a bit with my own daughter but I know there is so much more I can do. It just seems like I need more than 24 hours in a day. :) Here’s to a great week! I hear you! Sometimes I wish there were more hours in the day too… unfortunately 24 is all we’ve got to work with! Thank you Julie! I love trying to think up cool things to do with my kiddos. 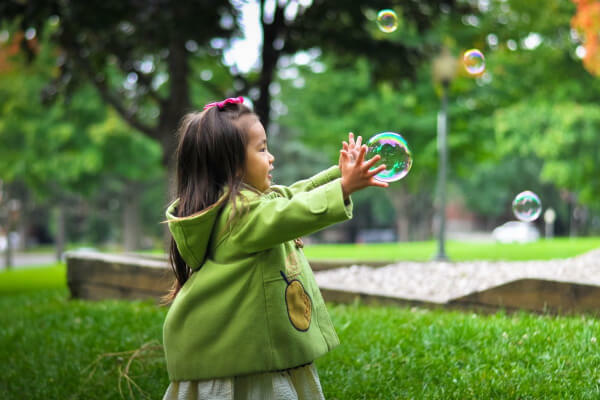 It’s easy to slip into the caretaking role with little ones. I’m happy this served as a gentle reminder to do something with them. What a delightful list of things to do that would bring joy in the moment! I also want to savor those moments with my children. I’m glad you enjoyed this Susan. It the moments like these that have such an impact. I love this list! I especially love the photo booth idea. I’m really excited about the photo booth idea. I think we’re going to have a blast with it! Oh this hit me in the feels! I’m pinning this post. I frequently find myself doing things FOR my kids but not with my kids….it’s a good reminder is that what they need most is ME. I’m so glad you enjoyed this and found it helpful. Thank you for pinning! This is just loads of good ideas! What a great resource to refer back to when you are feeling a bit burnt out and out of ideas. I will definitely be coming back to this list! I’m so glad you enjoyed this Sarah. I had a hoot writing out the list… I can’t wait to do some of these. We’ve tackled a few already but I’m really looking forward to that monster cookie… and the photo booth! Homemade pizzas are THE best! We have such fun making (and eating) them. I like this reminder, Jennifer. In the midst of running errands, running the house, and trying to fit in a spot of ‘me’ time, the day can certainly get away from you. I appreciate the suggestions. I will definitely be adding the Days of the Year to our list – how fun! I wanted to make a printable but time got away from me. Now that you’ve mentioned it, I definitely will (and I’ll let you know when it’s done). Totally! I’ve been thinking a lot on how I spend my time everyday and I felt like I’ve ignored my daughter. I mean, we are together most of the time but it seems like I needed to do more and spend more time with her not just do things that she needs. Be with her physically/emotionally/spiritually. Thanks for these ideas. Will definitely take note of it! I’m so glad you enjoyed this and that you could identify with it Danielle. I hope you find some great activities to help you connect more often with your daughter! I was feeling the same way before this weekend. I made a point to take my kids for a little outing. It was nice to reconnect. This is a great list. A little outing can make a huge difference… for them and for you! We live such busy lives that simply connecting with our loved ones is so important! What a wonderful post! I will save for myself and share! I’m so glad you enjoyed this Maria! Thank you for sharing. Ahhh! I love this Jennifer! I’ve had the same exact thoughts, like I do stuff FOR them all day, but you’re so right…THEY may not process any of that as my way of showing love for them. I love this list of ideas you came up with, totally pinning for my own inspiration. Dang, you are knocking the posts OUT this year, loving all the inspiration I’m getting from your blog! I am blushing… what a lovely compliment. Thank you Jessica! I hope this list provides some inspiration for you. LOVE these ideas! I can’t wait to share my favourite things with my son like walking in the meadow, harvesting veggies and fruit from the garden, hide & go seek… ahhhh being a mom is such a great excuse to keep being a kid, isn’t it? I hope I never have to “grow up”!! Thanks for these fun ideas! I love the ideas that you shared Stephanie… your son will definitely enjoy those activities. I really love that quote. I spend entire days doing things FOR my children, but not with them. Even right now, well.. I’m reading your blog so I guess that’s not really for or with them, except for the education, so I’m going with FOR them. Scarlet loves everything on your list! Right now her favorite things to do with us are sledding, reading books, puzzles, board games, and going to Disney World. I’m so glad you enjoyed this Tamara. I love what Scarlet loves… those are great activities. One day I will go to Disney World (and meet Donald Duck)! Thanks for sharing your thoughts on connecting with your children. YES! I LOVE this and it’s so true. You hit home and made me realize I need to do MORE. (If it’s possible…) Sharing. And CONGRATS on Huff Po! So happy for you! See…persistence pays off…2015 will be deliberately spectacular! I’m so glad you enjoyed this Kristen… and that it resonated with you. Hello Jennifer, I love this list! I am sure you will come up with more creative ideas. Meanwhile, I will start with some of those things you shared here. I’m glad you enjoyed this list Ifeoma. Yes, I’m sure I will be adding more as time goes on. Exactly Emily! The simple things really do satisfy! My son’s favorite activity is to run, around the house throwing his baby brother’s sensory balls at each other. They’re soft enough not hurt or break anything (for the most part) and we get some exercise in the winter. Everyone wins! Ha! sounds like an awesome and fun time! I am definitely guilty of doing more FOR than WITH my kids! Especially with my oldest. Since she’s most self-reliant of the bunch (I have three when I count the daycare baby) she often gets left alone to play Legos or play dough or what have you while I’m changing diapers, feeding babies and getting the boys to nap. By the end of the day she’s starved for attention. So I usually let her stay up later than her brother I and read with her or do a quiet activity of her choice with her for a half hour before she goes to bed. It’s not perfect, but it seems to fill her love tank for now. It’s challenging to balance this, isn’t it?! It sounds like you found a way to connect more though. “Filling the love tank”… perfect. 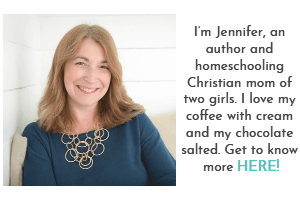 Hi Jennifer, it is easy to forget that children don’t really count the things we do for them as being too busy to spend time with them. Just making time to do one thing a day with them not only makes them feel good, it helps to create some lasting memories. A surprise past bedtime family movie with popcorn is always going to be a winner, but so too is just colouring away whilst sharing thoughts and feelings. I must say that since I started blogging we have spent many an hour laughing through old photos. With older children it is harder to spend quality time with them. The other night we were all sat around each selecting songs to watch on YouTube and singing badly along to them..It was fun and we all had a laugh at the old 80’s music videos. I’m trying to spend as much quality time as I can with my children, especially because as you mentioned… it become harder to do so, with the older the get! Awesome list… thanks so much. Sometimes I feel like I’m running on empty and have trouble being creative in thinking of ways to connect with my kiddos. I overthink, too. It’s the simple things. Pinning to use. The simple things seem to go the farthest too (and you’re more likely to do them because they’re easier to implement)! Can I just say how freaking genius you are! As I am reading through this list, nodding with each idea, saying “OH YEAH! I LOVE THIS!” you have the tweets in between for me to send out…they are PERFECTLY placed, almost too good because as soon as I raise my hand and think “OMG I LOVE THAT!” there’s that suggested tweet that I cant help but share! I’m so delighted you enjoyed this. I like to think of fun and simple ideas to do with my girls and I’m thrilled to share it with you. Thanks for tweeting, tweeting, and pinning! Love this, Jennifer! As part of my New Year’s Resolution I started to slow down and take more time enjoying my kids. Tickle fights, trips to the parks, tea parties, you name it, I want to relish every moment I can. Oh, Jennifer, I can absolutely relate to doing more for my children than with them. We’re probably all guilty of that at one time or another. Thanks for the reminder today that our children need us to do things for them, but they want us to do things with them. Great list! I’m pinning this one. What a wonderful post! 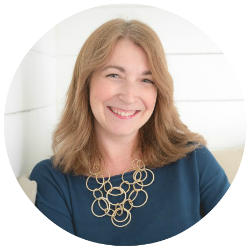 I love the name of your blog – it says it all really. We really need to be deliberate in our actions as it is so easy to just let the days slide by in a round of routine cleaning, cooking, washing and all the daily looking after things. Thanks for all the great suggestions – I will definitely be using this list for inspiration.